Does evolution take imagination? - READY... SET... QUESTION! Recently, a critic has voiced being unhappy with my referencing of the work of Sir Gavin deBeer and thinks I should have referenced Sean B. Carroll instead. The claim was that deBeer is an old source that is no longer worth mentioning in light of a younger scientist that happens to be more relevant, accurate, and up to date. This argument seems to be logical until we remember that Darwin’s Origin of Species by Means of Natural Selection was published nearly a century before the work of deBeer that is in question. Darwin’s most famous book was published in 1859, so are evolutionists no longer willing to mention the work of Charles Darwin? It is quite obvious that WHEN a book is published, is not as important as WHAT is published in the book. Like Darwin, the work of Sir Gavin de Beer has lasted the test of time and is still regarded by evolutionists as relevant and accurate. 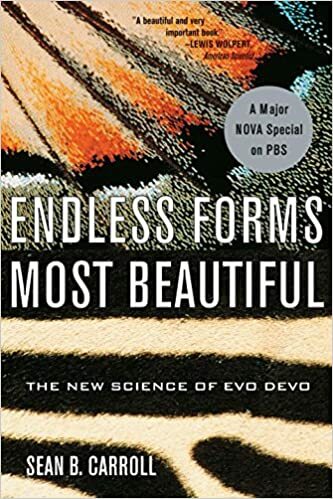 The critic was so kind as to recommended me the book Endless Forms Most Beautiful by Sean B. Carroll. I’m not sure what this critic was hoping I would find, but while reading their said recommendation, I did not find a word that discounted the writings of Sir Gavin de Beer. I did, however, find Carroll’s view of science to be appalling for his inclusion of REVELATION & IMAGINATION. In his book, Carroll writes about a strange view of the nature of science that is in contrast to the scientific method and what the National Academy of Sciences has outline to be scientific. Carroll communicates that the same type of “revelation” found in music causes a scientist see a deep connection and more clearly understand the world. Granted, music can bestow revelation and it is a beautiful thing for the person it is happening to, but music is subjective. The revelation that one may experience or feel deeply when listening to Beethoven is not able to be replicated by all lovers of music. Perhaps in heart of another, the music of Kanye West produces the same sense of revelation. All the while causing fog and disconnection in the heart of the one who experiences revelation via the music of Beethoven. Science is not like music at all. Music is subjective and is different for all who engage in it. Science is only that which is capable of producing empirical data that can be scientifically validated by others who follow the same, clearly outlined method. Carroll’s view of science is that of an Amazonian Shaman. The hocus pocus of revelation is not part of science in any way. However, if one is looking for an accurate view of science, the National Academy of Sciences does a good job. Revelation seems to be important to Carroll’s personal beliefs of which he has the right to hold. Yet, when it comes to the testing of his revelation-based-science “in the real world,” empirical data has yet to be produced. It seems Carroll communicated that discounting the scientific validity of biological evolution is only done so by those who lack imagination. Yes, this is true and thank you, Carroll!!! Finally, someone has come out and precisely identified the fuel that has powered the evolutionary debate since 1859! Evolution absolutely does require imagination in order for it to be accepted. Sixty-six percent of Americans do not subscribe to evolution. We live in a science-focused society and we know science is good and true. This is why only 33% of American’s subscribe to the imagination-based-pseudoscience of evolutionary biology. Perhaps the issues I am having with Carroll’s “up to date voice” on the subject of evolution is the fact that he gives scientific value to philosophical and mystical ideas. Granted, Sir Gavin deBeer may be old school, but at least deBeer did science that could be validated with empirical data. I cannot say the same for Carroll’s non-scientific use of revelation & imagination. However, please do not assume that I am communicating revelation and imagination to be worthless, for they do in fact have value. Science can be furthered greatly by the testing of new hypotheses created by using revelation & imagination… or art, music, religion, and pretty much anything one could think of. Yet, creating a hypothesis is not science, it is only the first step in the scientific method. In science, questions are good because they lead to hypotheses which are the attempts at answering said questions. Once an educated guess or hypothesis is made, the next steps must be taken in order for true science to happen. In science, revelation and imagination can only be valuable if leading to a hypothesis. Yet, a hypothesis is only valuable if it leads to positive testing results, replication, and verification by others… aka empirical data. Carroll’s claim of imagination being necessary for accepting the idea of biological evolution is correct, it just is not reflective of how science works. Previous PostIs criticism allowed?Next PostIs evolution legal?